We’re well acquainted with the British monarchy thanks to The Crown and the media obsession with royal weddings, but they aren’t the only family with a storied legacy. Here, we discover how three Eastern dynasties lived centuries ago – and how they left their mark on their respective destinations. The tourists arrive at the Tiananmen Gate at dawn, hoping to be among the first to walk into the Forbidden City. What was a cloistered palace of emperors for 500 years now harbors the country’s grandest collection of imperial art and architecture – from the swooping gables of sprawling lacquered halls to the stone formations of the Imperial Garden. Before day’s end, 80,000 people will have toured the gilded temples and peeked into gargoyle-guarded palaces, soaking up tales of royal romance and conflict. Nothing has dampened China’s appetite for imperial lore. Younger generations, in their desire to reconnect with a history and culture beyond modern materialism, are riding a royal resurgence. Like Europe and North America’s ongoing fascination for Meghan Markle and Prince Harry, the Chinese are engaging with ancient landscapes and royal rituals that bring them closer to a near-vanquished heritage. There is no shortage of opportunities here in Beijing. 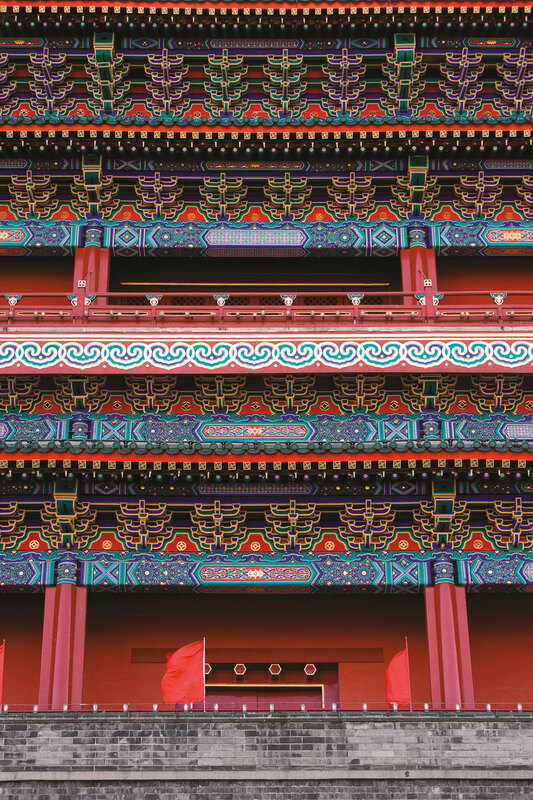 A short drive north of the palace walls is the immaculately preserved Prince Gong’s Mansion, a red-lacquered spectacle on a more intimate scale. Ornamental gardens and boating ponds ripple out northward, giving way to quiet lanes of antique cottages serenaded by birdsong. They lead to an 800-year-old market street and the legendary Huguosi Temple Snack Bar, still serving to standing-room-only crowds the delicate jelly-stuffed coconut pastries favored by the emperors. South of the palace walls rise the conical tiers of the Temple of Heaven, where emperors prayed for a fruitful harvest. UNESCO-anointed, it sits on a staggering swath of land among a harmonious array of hip-roofed halls. Inside each building, gold-etched pillars representing the months and seasons stretch up to deep-blue ceiling mosaics soaring towards heaven. Where once only the leaders of the kingdom could worship here, today any citizen is welcome to pray at the decorative altars, where the royal family would leave silk, fruit and grains in sacrifice. After prayer, locals gather nearby in the shade of gnarled, ancient trees. The act is poetic and Wi-Fi-free, creating a moment where all cellphones are laid to rest. The current hunger for experiences with royal heft extends to mealtime, too. Between their green juices and fast-fried chicken, Beijingers are rediscovering old standbys like ceremonial Peking duck, steeped in sweet, sticky sauces and Yuan Dynasty traditions. At Lunar 8, one of the city’s finest dining rooms, birds are roasted over jujube wood according to 700-year-old methods and carved at the table to be served with heaps of condiments. 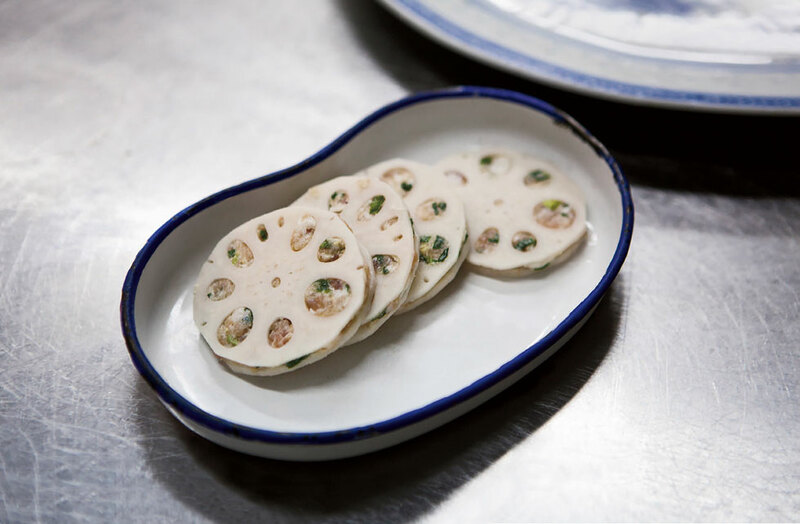 In a nearby Qing-era courtyard, Family Li Imperial Cuisine serves dishes made with heritage ingredients such as osmanthus, sugared lotus and cubilose. It is mind-boggling to think that modern diners are experiencing the same flavors that once enticed emperors. As a new class structure emerges, with some Chinese earning more than the emperors themselves, it’s no surprise that a hunger for the royal traditions of the past continues to intensify. Rajasthan is often referred to as the Land of Kings and is undoubtedly the jewel in India’s crown. It’s home to Mughal-era palaces, colourful festivals and fashion that harks back to another, more regal era. Running through the heart of its capital, Jaipur, M.I. Road hosts a cavalcade of mopeds, bicycles, diesel-spewing cars, lumbering cows, camels and elephants, and thousands of people. It’s as modern a scene as you’ll find in India. Yet all that changes at Johari Bazaar. Here, at the oldest market in Rajasthan, merchants specializing in jewelry and fabrics sell elaborate gold chokers dripping with emeralds, and expertly printed textiles in heritage jewel tones – vestiges of the region’s royal history. Today’s travelers come to Jaipur for the royal splendour, for the whiff of royal warriors and martyrs still revered across India. And their first taste is here, in the rose-tinted colonnades leading to the City Palace, where precious-gem dealers have served the ruling classes since the dawn of the Raj. 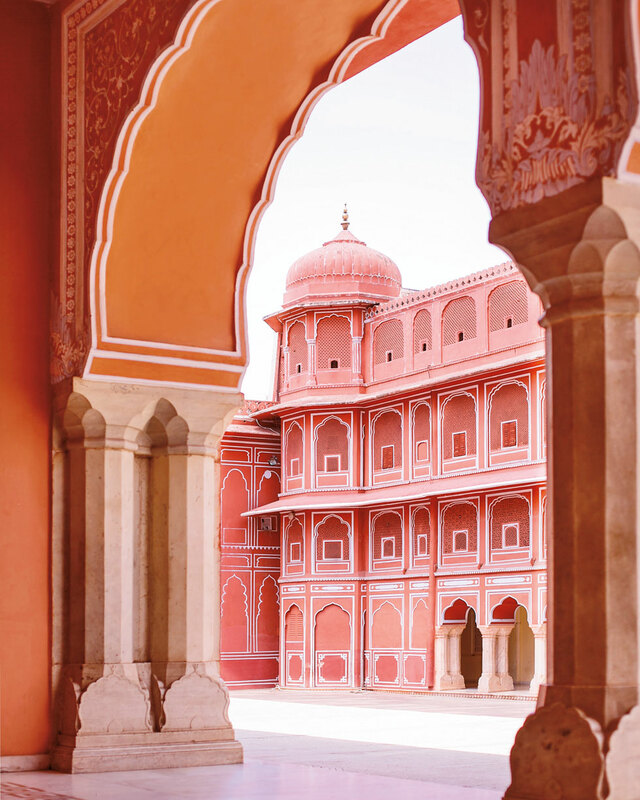 It’s located in the oldest section of Jaipur, the so-called Pink City – a nickname coined by Prince Albert at the height of British rule, after the maharaja had the entire town painted a welcoming coral hue. The 17th-century City Palace’s exquisite arcades and elegant scalloped doorways envelop a vast courtyard that may be the most tranquil spot in the city. But even this is outshone by the Hawa Mahal, a gentle pyramid of lattice-fronted galleries designed to allow royal consorts to watch the street life without being spotted. Not far from the city, the Monkey Temple of Galtaji, located in a small town called Khania-Balaji, is nestled into the hillside and surrounded by natural spring water. 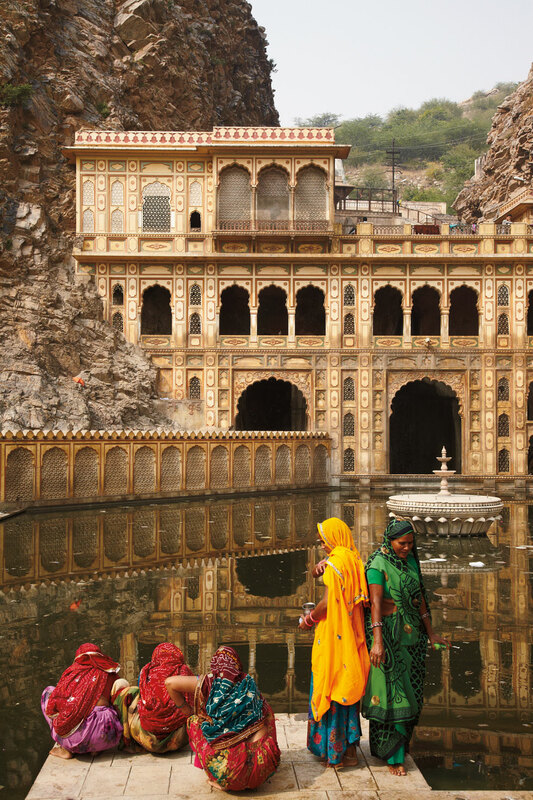 Hindu pilgrims – and royals – have been bathing, praying and making offerings to the Gods here for decades (alongside a long-standing tribe of monkeys, from which the spot gets its name). In Jaipur, those in-the-know take a break from touring at the equally regal Bar Palladio, a café that modernizes queenly motifs with its decor. Indian and Italian dishes are served side by side, but traditional bites such as tarator – flatbread with a yogurt, carrot and caraway spread – are musts to taste. But the most delightful throwback to the age of the maharaja just might be a visit to Fairmont Jaipur. Past the fortress-like gateway with its carved wood doors, where trumpeters welcome guests in royal fashion, visitors can experience a quintessential Indian Masala Chai tea service at the hotel’s Anjum tea lounge, arrange day trips such as market tours and private elephant rides, or simply sit back and enjoy the views of the majestic Aravalli hills off in the distance. A uniquely Hindu-Buddhist island in the majority Muslim archipelago of Indonesia, Bali has a rich royal tradition – and it punches above its weight in both cultural influence and international interest. This is partly due to its popular 1,000-year noble lineage. 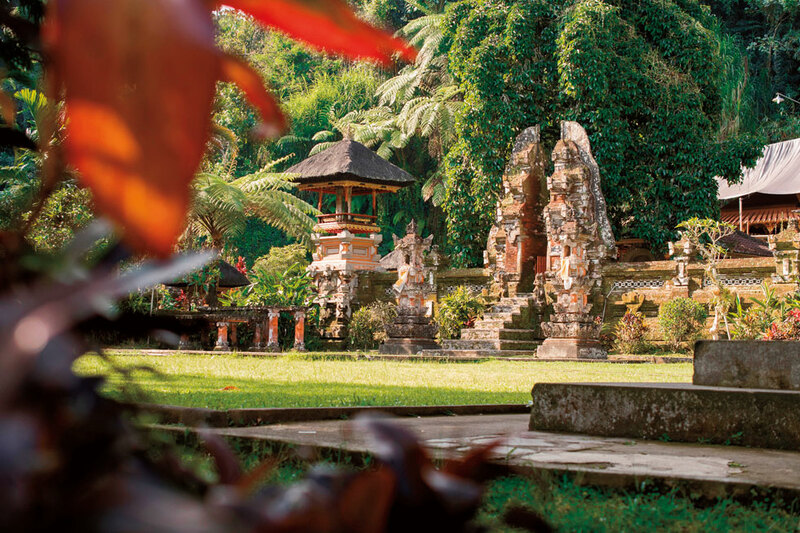 Royal relics are everywhere, from the glorious palace at Ubud to tiered temples and manicured gardens around the city centre, as well as local jewelers specializing in techniques passed down for centuries. The journey to the workshop of jewelry brand John Hardy follows rural back streets carved out of rice paddies and rainforest, past elephant sanctuaries, spiritual retreats, roadside shrines and stone artifacts in the state museum. Arriving at the palm-fringed gates is just the beginning. Set within a sustainable bamboo forest, the facility is its own communal village. In the open-air studios, craftspeople descended from the royal jewelers showcase techniques going back to the Balinese courts. Visitors can watch them embellish chic gold cuffs with motifs once reserved for Javanese sultans, then browse a thatched showroom that sits on stilts before strolling through gardens and the on-site organic farm. John Hardy’s complex offers a rare glimpse into the sophisticated tastes of the royals who dominated the island for much of the past millennium. Passionate consumers of fine, gem-studded jewelry, they settled in the island’s southeast and left vestiges of a lavish lifestyle. Prince Gde Agung Sukawati himself patronized the artists and designers who began visiting the island in the 1920s, creating a colony of bungalows and kickstarting a cultural legacy as great as any European country. 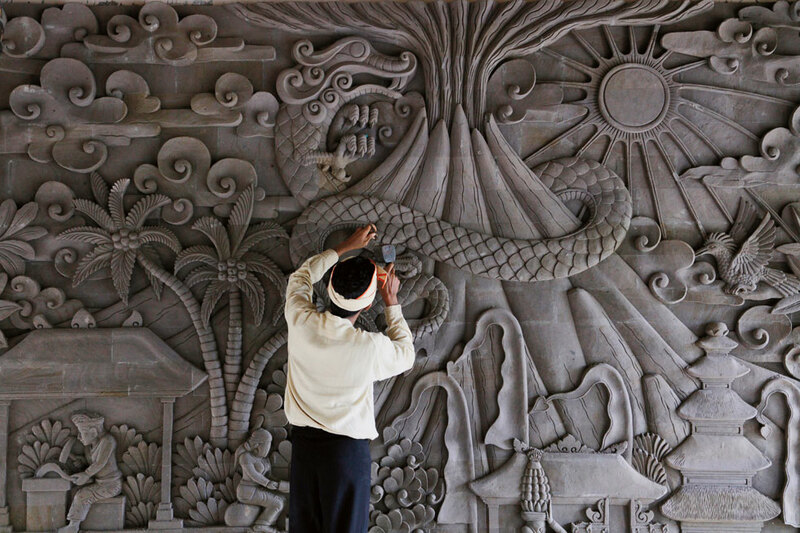 Modern-day Balinese royals like Prince Tjokorda Gde Putra Sukawati continue this practice: The Prince serves as chairman of Museum Puri Lukisan, which preserves traditional Balinese painting and wood-carving. Or to try out the local royal version of high tea, head to Biku Bali restaurant (where 50-plus varieties are on offer). You might just be served by owner Jero Asri Kerthyasa, a royal princess of Ubud, or one of her three children. Ubud is already beginning to flourish as a fashionable destination after the reconstruction of its sculptural palace complex, situated in the shade of banyan trees. While the landmark is still home to the descendants of the ruling Tjokorda family, it nevertheless welcomes visitors to enjoy its sinuous gardens and monolithic temples embellished like wedding cakes. This spectacle is relatively modern in Bali’s history of civilization. Further north, across the stepped electric-green landscape, sits the island’s most remarkable royal relic: the ancient Gunung Kawi Temple. Arranged along both banks of the Pekerisan River, it consists of 10 ancient tombs carved into niches in the cliff face – homages to the 11th-century Udayana Dynasty King Anak Wungsu and his god-like power. How inconspicuous they appear, shaded by jungle and darkened with age – a delight just waiting to be discovered, like most royal gems of the East.